This entry was posted in Linux, Music, Sketchbook and tagged ardour3, calf, caps, drowaudio, flame studios, guitar, guitarix, linuxsampler, lv2, rakarrack, telecaster by lsd. Bookmark the permalink. 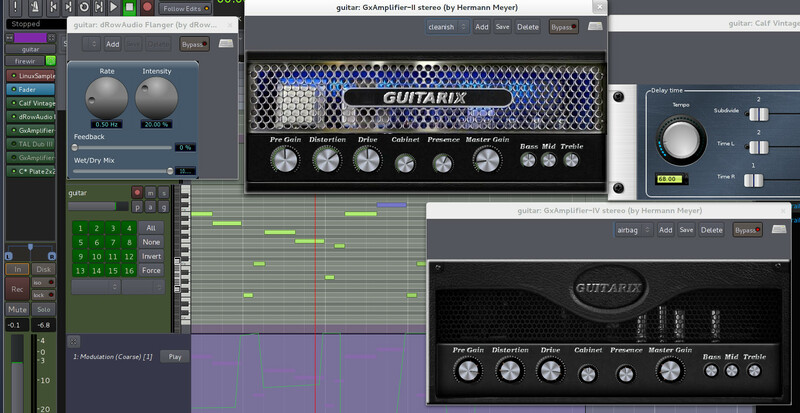 The sounds you got in Guitarix intrigued me so I went to the website and checked out other stuff as well. What they are doing is pretty amazing and I think I’m going to play around with Guitarix soon as I haven’t really explored it before having much hardware effects/amps. The fact that they have an LV2 effect is even more amazing. There is certainly some cool stuff going on in the FOSS world. As to making guitar sounds with synths and such, don’t forget about that Tunestorm (http://opensourcemusician.com/index.php/Tunestorm) with JazzyEagle? Rock on. Look forward to hearing more of your stuff.